Ambulances being used in Devon and Cornwall are being kitted out with reinforced stretchers to cope with overweight patients. South Western Ambulance Trust said it has so far purchased 11 of the wider stretchers, which cost more than £7,000 each. The stretchers can bear a weight of up to 47st (298kg). All new ambulances bought by the trust in past three years have the capacity to carry the larger stretchers. The growing problem of obesity is not restricted to Devon and Cornwall - every ambulance service in the UK has started buying specialist equipment to deal with obese patients. Neil le Chavalier from the South West Ambulance Trust said the new equipment was necessary. "It used to be 'load and go' years ago where you physically manhandled patients," he told BBC News. "But nowadays there are devices we use in order to protect our staff and we've also got a duty of care to the patients." The trust currently has a fleet of 156 accident and emergency ambulances and a further 76 vehicles used to transport patients for hospital appointments. 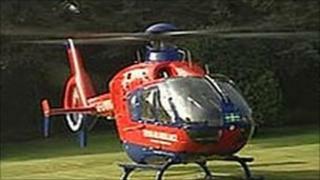 The Devon Air Ambulance Trust (DAAT) said the lifting stretcher on its two helicopters can bear up to 23st (146kg). For heavier patients, crews would have to rely on the help of other emergency service personnel who have been trained on manual handling, it said. Nigel Hare, a DAAT paramedic, said he has only been unable to help two patients who could not physically fit into the helicopter. "Heavier patients do present a challenge to us," he said. The Ambulance Service Network said throughout the UK trusts needed vehicles and equipment which could respond to what could be potentially life-threatening situations.